I love Halloween and since it is now October I am so excited to share my Halloween tutorials with you all! I was going for an elegant look to these cupcakes instead of the cute or scary look. I decided to focus on black and silver with LOTS of glitter :) The cupcake toppers are made out of chocolate so it is easy to eat and tastes great! 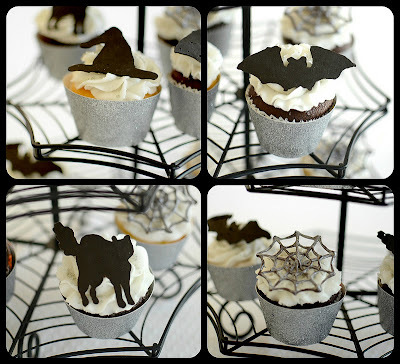 Don't you think these would look great at a chic Halloween party? I love these! I miss you and your cuteness, Brookie! Exquisite! I'm not a fan of Halloween, but I love your approach. 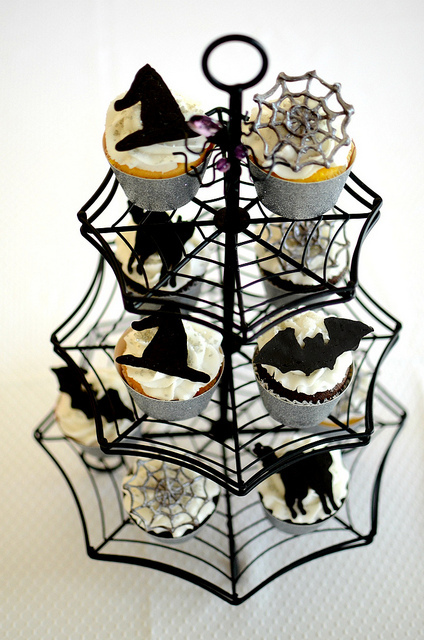 Where did you get the adorable spider cupcake stand? These cupcakes are so clever. It is from Home Goods, but my mom got it last year! You are amazing Brooklyn! I love and miss you oh so much! I missed baking with you the past conference! Tutorial Tuesday: Candy Corn Cake!